He got confused and angry about his legal situation, again. Trump, whose temper seems to have gotten even worse than usual post-midterms, with the prospect of more Russia indictments and real investigation of his finances and Russia ties looming, lashed out on Twitter today. 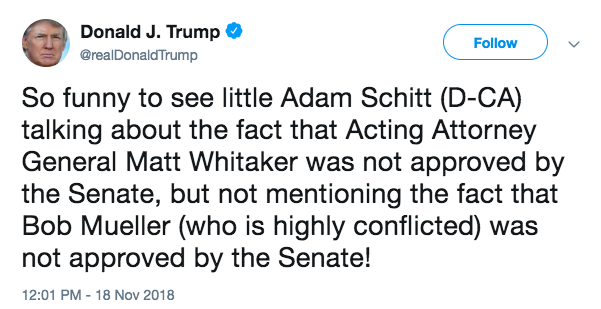 His target was Rep. Adam Schiff—or, as Trump called him, "Adam Schitt." 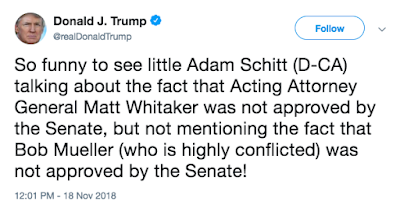 It's hardly the worst thing Trump has said, and Schiff himself seemed to take it more or less in stride. Wow, Mr. President, that’s a good one. Trump is easily confused on legal matters, but whether or not he knows it, he is wrong and Schiff—who will chair the House Intelligence Committee starting in January—is right. Under the Constitution, principal officers of the government (which means the heads of departments who report directly to the President) must have been confirmed by the Senate. Whitaker, who is apparently under investigation for fraud by the FBI he now oversees, was not serving in a Senate-confirmed role at the time he was elevated over several qualified Trump appointees in the DOJ. It's still possible that the courts will rule this doesn't apply to the acting attorney general, but precedent isn't on Trump's side. Special counsels are never confirmed by the Senate, but for the record, Mueller has been confirmed twice in a different role, as director of the FBI. Given the number of times Trump has claimed otherwise, it's not clear whether he genuinely doesn't know this, or is simply pretending not to. A president who can't control his emotional outbursts isn't fit for the job. Neither is a president who can't or won't hold on to basic factual knowledge related to that job. A president should probably have at least some dignity, for the sake of the office.